the Global Summer of Peace organized by James O'Dea, international social healer, former Executive Director of the Noetic Institute, former Executive Director of the Washington, D.C. Office of Amnesty International, Washington, D.C., and lead faculty for The Peace Ambassador Training Programs produced by The Shift Network. The Lake County Summer of Peace 2012 is the first county in California to join the international community of Peace. As with the worldwide Summer of Peace taking place on all continents, the Lake County Summer of Peace will be celebrated from June 22 through September 21, 2012, the International Day of Peace, as declared by the United ations in 1984. A PEACE INVITATION FOR YOU! The Lake County Summer of Peace 2012 invites you to join in the planning, execution, and participation for a unique and historic event in Lake County, California throughout the summer of 2012. Planning started in July, 2011, and continues now and throughout the summer. Joining other counties, states, regions, countries and cities around the world, Lake County has a unique opportunity to consciously and positively move with the shift that we all feel in human consciousness. Together we are becoming proactive in the social healing of our community by creating a more balanced, harmonious, healthy and unified place to live and work. Your participation in the new sense of choice, independence, collaboration and personal responsibility for our individual and group well being is effective here and now, and also ripples out into various parts of the world, making you a driving force for change at home and beyond. As we develop our own economic, environmental and esthetic vision and collaborative creation of our future and that of our children, neighbors, friends and associates, we are setting a template for other cities, counties and rural communities here and abroad. WELCOME TO TOURISTS FROM WESTERN STATES AND BEYOND! The Lake County Summer of Peace 2012 welcomes you and your family to participate in all peace workshops, forums and other events around the lake. “Share Your Message of Peace with Others” is the motto for the Lake County Summer of Peace 2012! If you live in Ukiah, Redding, Sacramento, Santa Rosa, from San Francisco to Pelican Bay, or from the Bay Area to southern California, Lake County invites and welcomes you to visit and tour our exquisite Lake mountain-lake region! News of this event will be distributed throughout the western states and into other areas of the U.S. and abroad. Singles, families, students, groups, large or small...all are welcome to come and visit Northern California's beautiful Clear Lake -- to see and taste our delicious and widespread hospitality, and partake of our quaint hotels, motels and bed and breakfasts, along with the special gifts Lake County has to offer: the oldest and largest fresh water lake in California. (some say in the western hemisphere), dominated by the Mysterious Mt. Konocti, ancient home of the Pomo Indians. Fine restaurants and unique shops, mountain hiking trails, bass fishing and other water sports, golf courses, five casinos, live theatrical entertainment, fairs, street events, storefronts and bistros around the lake and many other workshops and events -- all celebrating and sharing the many aspects of peace. Many will want to visit and tour some of our more than 35 new world-renowned wineries, tasting rooms and vineyards, that comprise the new Wine Country of Northern California. If you are a resident of the Lake area, you may inquire and set your date for your own individual, business, group or agency workshop, video, play, concert, presentation, art, dance, or other contribution to peace and prosperity. Health, beauty, sustainable economic, social and environmental programs offer education, new technologies and innovative approaches designed by community members to inspire, energize and entertain Lake County residents and visitors. Churches, spiritual groups and soul projects, may offer their own ways and paths to inner peace. All military personnel, veterans and especially recent combat veterans are invited to contribute their ideas of peace and adaptability to new and unfamiliar circumstances. Proposal initiatives and workshop ideas are welcome! Most events will be presented at low or no cost to the general public, including residents and visitors. If you would like to conduct a workshop or event, you may submit an application under the Contact tab above. Or you may submit your questions, interests and ideas in the form at the bottom of this page. We will help you plan, direct and connect with your own sharing of peace. Your only costs will be for the budget you create yourself to produce your special class, lecture, workshop or event that you wish to share with others. The emerging vision of Lake County is to develop our remote, rural area as a cultural colony around our beautiful lake, with little bistros and small stages along our shores for musicians, artists, writers and the public to meet, talk and enjoy the local food, wine and music. We are blessed with a superb Lake County Symphony Orchestra and many vocal groups and individuals, including operatic and popular singing groups. Individual instrumentalists and small and large bands abound. Lake County has attracted an unusual number of music groups, composers, fine artists and writers to the area, who are already setting the tone for a rural township environment, stimulating and enjoyable for guests and tourists and ourselves. Talent and growing interest in stage and radio have grown exponentially in the past few years, and KPFZ Community Radio (88.1 fm), the Soper-Reese Community Theatre, the Weaver Theatre, the Fairgrounds Little Theatre, the Tallman Hotel and the Lake County Arts Council provide important venues and gathering places for expanding our creative capacity and appreciative audiences among new and old residents of the area. Several new senior centers and other organizations meet the needs of the aging. Senior Centers of Lakeport, Kelseyville, Clearlake, Clearlake Oaks, Middletown and Lucerne are joining the entertainment business with increasing music and other stage events, enhancing food and fellowship gatherings and their own culinary and performance talents. From small, intimate dramas and comedies to huge musical productions, opportunities abound for the development of the creative spirit and growing public performance capacities in adults of all ages, including our youngest actors, singers and dancers. Ethnic groups add to the rich fabric of international human talent and culture now representing Lake County. Our Hispanic population is growing. Lake County is multi-cultural and inclusive, with Native Americans, Mexican and immigrants from abroad. Interest in health and expansion of the human spirit are evident everywhere, as demonstrated by the more than 350 non-profit organizations in the county. Many diverse groups, including two hospitals and a growing number of exercise and health spas, including the Sutter Wellness Center, Quail Run and the anticipated return of the popular Konocti Harbor Inn and Health Spa, all contribute to the lively pulse, health and well being of Lake County residents and guests. The Lake County Co-op and other food/farm groups, including Farmers Finest, are changing our habits about food, diet and organic gardening. Transition Lake County (TLC) is leading the way in our unique collaboration with earth and its elements: air, water, earth and fire. Biodynamic and permaculture gardening are flourishing throughout the area. Vineyards and wineries are replacing some of the pear and walnut homesteads of the past. Technology has not forgotten our remote county; we are a part of the vanguard of developing ideas and new ways to expand economic and human capacities for communication, music, economic, political, health and social organization that fulfill the needs of the larger populace into the future. For example, a carefully designed community plan for broadband cable will link even remote areas with more populated areas and ultimately a consortium of northern California counties, toward a long-term and more comprehensive global network. We now have a popular online newspaper, Lake County News, adding a fascinating filip to our traditional print news source, the Lake County Record Bee. In addition to Bicoastal commercial radio, KXBX, Lake County Community Radio (LCCR) KPFZ 88.1 fm offers dynamic volunteer programming with over 100 hours weekly of commercial-free community news, music, public affairs (talk, interview and call-in shows) and live feed of major community events. KPFZ a tiny powerhouse station transmitting from its antenna on Mount Konocti while simultaneously streaming globally to the planet live in real time. Click on the KPFZ 88.1 fm radio tower to listen to live streaming on the internet globally. Our entire county is changing! For all our charm, history and traditional practical purposes, we are also morphing into a new entity, culturally, psychologically and economically! RAPID CHANGE PROJECTED IN 2012! Nonetheless, who and what we are as a community is likely to look outdated in five years. Our world is changing so rapidly that we now have an opportunity to become active social healers and supporters of our community during these changes, and are called to action to take part in a massive transition during our lifetimes. Culturally, psychologically, politically, socially, physically, we are called to participate in the deep changes within and around us. While we are changing, we are also at a crossroads to shape and recreate ourselves, our towns and the county we love, opening our doors to tourists, new business, new low-impact industry and restored property values in our beautiful countryside. And to shape our local, state and national social policies to best serve the residents, our children and grandchildren in all future generations. It is our hope and dream that tourists and other visitors will take home with them the ideas of the Summer of Peace, to enhance and harmonize their own hometowns and regions with new and many sustainable ideas. OUR LAKE COMMUNITY AND YOUR OPPORTUNITY! 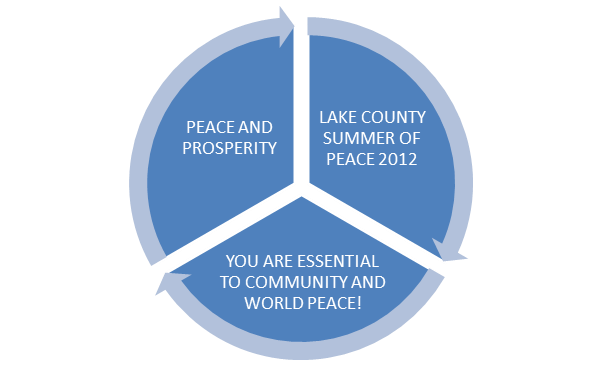 The Lake County Summer of Peace 2012 offers countless opportunities for you to communicate your vision of the county, state and country, and how you would like to influence that change. This is an opportunity for individuals, organizations and communities to exercise their true right to choice. “We the People”…demonstrates our choice, our will, our commitment and our common determination through traditional leadership, occupiers, movers, shakers and other changers of the social contract in a peaceful, caring, mindful experience that is fun, healthy, positive and economically beneficial to all. It is up to us to make it happen! Your contribution of time and talent to the great mix of people and ideas in the Summer of Peace can contribute in many ways. The transition will take place at the initiative of individuals and organizations throughout the County (i.e. you!) who want to create positive change toward inner and outer tranquility, openness, tolerance, humor, inclusion, cooperation, givingness and forgiveness, harmony, creativity, mentoring, compassion, and the reduction of family violence and bullying in all its forms; most individuals and organizations want to contribute to the general prosperity of the area and to other positive and peaceful ideas, especially those you individually wish to manifest. These are likely to include health, technological, environmental and community policy changes. During the Lake County Summer of Peace 2012, numerous forums and symposia will be provided in your neighborhood or another sector of the county to meet with family, friends, associates and other community members to discuss parallel or opposing views around the lake in convenient venues, ultimately to create positive, practical and workable peace solutions for our lives. This is our opportunity, and can be our commitment! Your specialty, your business or non-profit group can participate and contribute to the peace stream...toward greater unity and prosperity for the whole community! Through your own ideas of peace and prosperity, you can include introductions of your professional services, sales, discounts, open houses, store fronts, new products and other offerings that bring good will and creative energy to Lake residents, businesses, tourists and other guests. Individually or corporately, you may personally or collaboratively participate in the Lake County Summer of Peace 2012, with your own events, workshops, media events (radio, television, film, video), live stage and online programs. We will help you! You can create and develop lectures, plays, poetry, concerts, and other entertainment or educational programs on health, communications, relationships, environment, area development, exercise, music, art (children's or adult), sculpture, cross-culture programs, dance, drumming, singing, education about health and relationships, gardening, environmental improvements and new technologies through joining the planning and execution of the Summer of Peace here and abroad. Call us, and we can help you shape your own show, schedule and support it throughout the summer! You and your business or avocation can demonstrate your dedication to peace and its many qualities through your products, services, sales and events. Think about the various meanings of peace (i.e., love, kindness, acceptance, tolerance, beauty, compassion, organization, inclusion, forgiveness, communication, courage, etc.). In the world of commerce, businesses, and especially the wineries, hotels, motels, restraurants and retail stores are the most likely to benefit from the Lake County Summer of Peace from the tourists coming into the county. How many tourists are likely to come to Lake County, and not try at least a few tasting rooms, drive around the wineries, golf courses and campsites to take in the beauty of the land, facilities and landscaped settings, and walk down our Main Streets, wandering into the unique shops, services and pubs. The summer events will also be fun, uplifting, educative and rewarding for all, including children, seniors, ethnic groups and other special interests. It is hoped that even the County will benefit from additional income derived from the economic benefits of the Lake County Summer of Peace. Lake County businesses can also link with another city, town or region (or an out-of-county business sibling) in the U.S. or abroad to share ideas and programs with the global Summer of Peace. We have booked our first events of the summer; and some 80 more workshops, plays, videos, concerts, demonstrations and lectures are waiting in the wings, all intended to be presented at low or no cost for all to enjoy in various venues around the county. OPENING CEREMONIES ON FRIDAY, JUNE 22, 2012! (2) Clearlake's Austin Park, Friday, June 22, 2012 at 7:00 pm. The first registration for the Lake County Summer of Peace was “Peace Dances in the Park”, now scheduled for the weekend of July 21-22, offering native dancing to the poetry of Thich Nhat Hanh, led by Barbara Christwitz, a teacher at Yuba College and a Founding Member of the Lake County Co-op. Drumming and possibly a guitar will preceed both events while setting up. Other events are listed in the Calendar. A safe, dependable and relatively independent economic environment is essential for peace and for an expanded vision as a tourist destination for families and couples. As creators of peace and custodians of our beautiful natural lake and mountain terrain, every resident in our lake area may act as a host for the Lake County Summer of Peace to tourists and other visitors. The Peace Center welcomes your ideas and participation to make our county the most beautiful, comfortable, clean, inviting and memorable vacation land in the U.S...the best investment we can make in our homes, lives and children's future. LOCAL CIVIC PARTICIPATION AND SUPPORT IN ALL EVENTS! The Lake County Board of Supervisors voted unanimously on August 23. 2011 to declare the Lake County Summer of Peace and the International Day of Peace as a county project for 2012, and many people and organizations are now in the process of planning the initial thrust of the campaign to develop opening day celebrations, large events, workshops and other events, and to post on our calendar of programs. The calendar events will also be publicized in a national PR campaign (emphasizing California and other western states) to attract tourists to Lake County. The City of Lakeport declared the Lake County Summer of Peace as an official Lakeport city project, and September 21 as the International Day of Peace, according to the United Nations in its 1981 declaration. All residents, businesses, churches, spiritual groups, veterans, ethnic groups, government agencies and employees, wineries, shops and restaurants are invited to share their ideas and creative workshops to participate in the 90-day event. The City of Clearlake also declared a Proclamation for the Lake County Summer of Peace 2012 and International Day of Peace in Lake County signed by Mayor Joey Luiz on February 23, 2012, urging our community to observe and participate in the activities all in accord with the universal wish for peace within and among all nations and peoples. See attached copies (under the proclamation tab above) of the three Proclamations for Lake County, the city of Lakeport and the City of Clearlake. The Lake County Board of Supervisors, the Marketing and Economic Development Departments of the County, and the Health, Social Services, Mental Health, Alcohol and other Drugs, Parks and Recreations and other departments have been urged by the county and cities to fully participate in the Lake County Summer of Peace. The offices of the City and County Development and Redevelopment Departments of Lakeport are supporting the opening of the Summer of Peace in Lakeport's Library Park on June 22 at 4 pm. Simultaneously, the Clearlake City Council Proclamation urges all Clearlake departments, agencies, businesses and nonprofits to fully support and participate in the 90-day festivities. Peace sculptures representing the community's commitment to peace will be established in each park, in a festive environment of of colorful peace flags, beautiful renaissance music, Pomo dances and official welcoming speeches by Roberto Dansie, Ph.D., an internationally recognized expert on the Mayan Culture. Dr. Eugene Tazo, a world teacher of ancient religious culture, will speak on ancient and traditional wisdom during eras of change. Comparable closing ceremonies in both Lakeport and Clearlake parks will take place on September 21, 2012. While all events and workshops following the opening will be produced daily at low or no cost to the public, if you can contribute to the Lake County Summer of Peace, the Peace Center committee will be able to advertise and publicize more broadly and effectively in the western states and beyond to magnetize more tourists and other visitors to the festivities for family fun, entertainment, education and enlightenment. Through our collaborative, diverse and harmonious contributions to peace and prosperity, a true communitiy project is emerging to create peace while boosting the local economy! emailing/scheduling and publicizing events throughout the year, and small promotional items to offer for fund raising. Attendance for most programs will be free or low cost; and each participant program (group or individual) underwrites its own events, make its own agreements with venues or parks, equipment, concessions and materials, according to its own needs and resources. Please let us know your ideas and how you would like to interface with the activities for the Summer of Peace. Coordination and collaboration help prevent overlap between many different programs. The programs are publicized through the calendar on this website, and through the entertainment and general news media, newsletters of the Chambers of Commerce and other non-profits, vineyards and wineries and other benefiting groups throughout the county and beyond. What do you wish to share/wish/intend/contribute/create/ or otherwise offer to the Lake County Summer of Peace 2012 for the good of all? What is your personal contribution to peace? Here’s to Lake County and our Summer of Peace 2012! Please call, write, email or personally submit your ideas and questions to make this a rich, sacred and festive season of beauty, fun, education, entertainment, and sharing for all to enjoy while raising the consciousness of our county, and guaranteeing that tourists and other visitors will want to come back year after year! In this way, we all become Lake County's hosts and hostesses. As a non-profit 501 (C) (3) dedicated to Peace and Prosperity, Lake Family Resource Center is generously acting as the Fiscal Agent for the Lake County Summer of Peace 2012. "There is no time left for anything but to make peacework a dimension of our every waking activity." Elise Boulding.